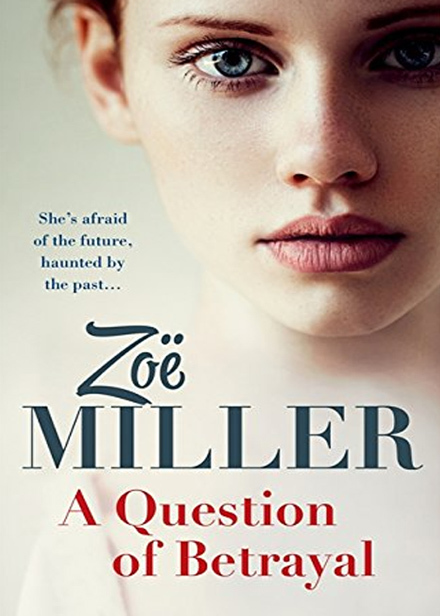 ’A Question Of Betrayal’ is the latest book by Zoe Miller. On a windswept beach in County Cork, a woman rescues a young man from the sea. A gifted musician, Luis Meyer’s life has fallen apart and he’s determined to end it all, until an angel of mercy pulls him from the water. More than thirty years later, Carrie Cassidy is still reeling following the deaths of her adored parents, John and Sylvie, in a tragic accident. She’s flitting from one job to another, unable to move forward, unable to forget the past. She can’t even commit to Mark, the love of her life, who has now moved on. Then a mysterious visitor reveals a secret that forces Carrie to delve into her mother’s past. When she does, she discovers a woman struggling to come to terms with her choices – a newlywed who, it seems, was in love with another man. Determined to find out the truth about her mother’s relationship with Luis Meyer, Carrie must confront painful and possibly dangerous truths. And the only person who can help her is the one she’s hurt the most. ‘A Question Of Betrayal’ is the second book that I’ve read by Zoe and unlike the first book I read by the Irish author, I found it harder to get into this book and found it to be a bit of a slow starter, but I then quickly changed my mind, once the story started to properly flow and the secrets and twists were revealed. The story is primarily seen through the eyes of Carrie Cassidy, a troubled young woman who has never got over the tragic death of her parents, who were both killed in an aeroplane crash and she feels a sense of responsibility and guilt over their deaths, as she encouraged them to go on an adventure. In the beginning, I didn’t understand Carrie and her issues, why she pushed everyone close to her away, but as the story unfolded, I began to understand the woman and the terrible sadness that she was burdened with. The story is spilt into two parts, the present and 1980. The present is Carrie dealing with her parents death, when out of the blue, she is contacted by a dying man who wishes to see her, his reason being that he knew her mother. Bemused by this, Carrie travels to Switzerland to meet Luis Meyer, a famous musician and finds herself on a journey where she doubts her whole family and life. The other part of the story is set in the summer of 1980, where Sylvie, Carrie’s mother, meets Luis Meyer for the first time, they become close, when she rescues him from drowning and two of them fall in love. The story cleverly flows between the two eras so fluidly and seamlessly, that never once was I lost within the stories. Between the two stories, it was the story that was set in 1980 that really caught my attention and made me race through the story, as I wanted to know more. It was gripping and intriguing that really made for surprising reading. Sat against the bustling Dublin streets and the Swiss mountains, ‘The Question Of Betrayal’ is a surprising story about lies, love and discovery and even though for me it was a slow start, it was a captivating read with a very unexpected and clever twist. You can buy A Question of Betrayal from Amazon and is available to buy from good bookshops.